Where are the students going, where are they coming from, in Minnesota’s Open Enrollment? 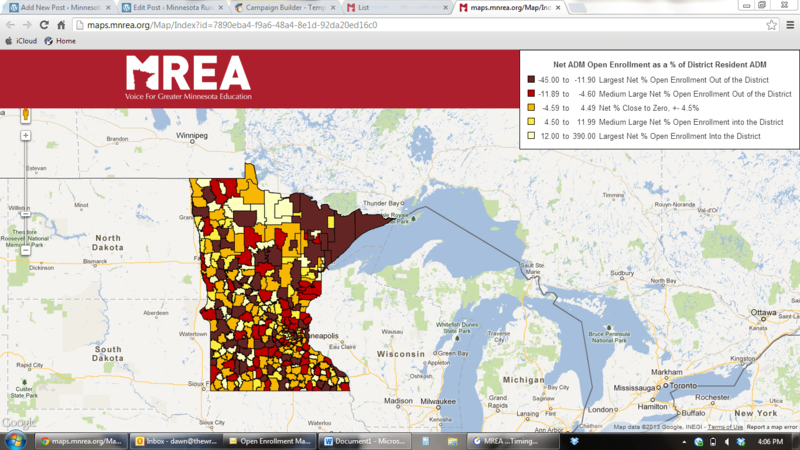 MREA released a map today to help answer those questions. Minnesota has had open enrollment for over two decades. The map aims to identify any patterns to the student movement. To display trends, the map shows student movement in and out of any district as a percentage of the resident students in that district. A thumbnail is provided below. Click here to view the interactive map. Open enrollment is both physical movement to neighboring districts and charter schools and virtual movement to on-line providers which can be districts or charter schools. The map itself makes no attempt to explain why students and families choose to move physically or virtually.